The Eclectic Butterfly is one of my newest designs for fall. Available in these three colours and more. This design has a more eclectic feel with a few Steampunk accessories added to the removable brooch. Made in a luxurious and soft hand painted Merino wool in two colour tones. To celebrate Summer I have added the butterfly accent to this new design and a Sale on my Etsy site for 10% off all orders $35.00 and up. The vibrant colours of this amazing yarn remind me of the beautiful flowers the butterfly flutters around spreading the joy of future flowers to come during the Summer months. Summers seems much to short here as our winters are very long and cold. I plant loads of flowers around our house so we can all enjoy the beautiful colours and the creatures that are drawn to them. This amazing moth we found on my doorstep the other day may not be a butterfly but the colours and size were something I had never seen on a moth. Absolutely stunning in my mind. We measured it to be about 3 inches in size. 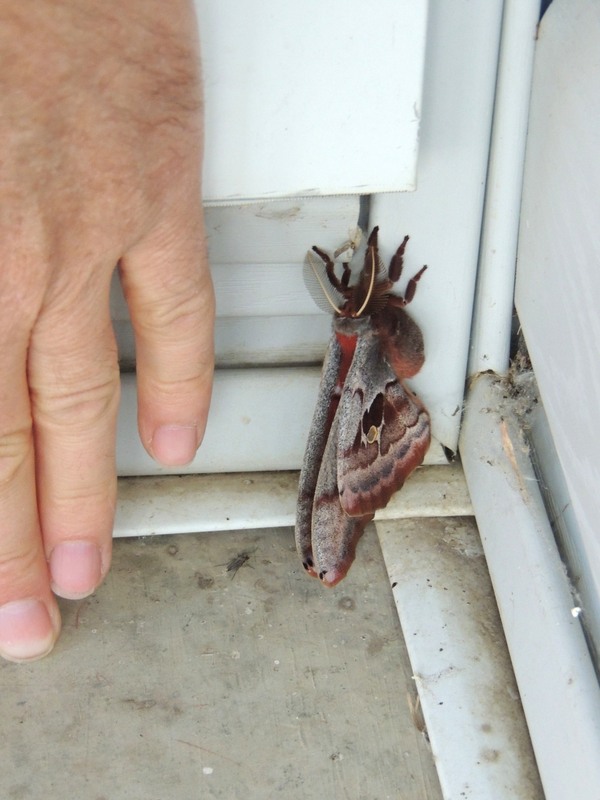 It only stayed the night, but what a treat to see such an amazing moth at my front door. I have also added the Eclectic Floral fingerless gloves to compliment the Eclectic Butterfly scarf. The scarf will also be in a smaller version with a lighter cost down the road. Many new designs are in the works for Fall including patterns and knitting kits for you to knit. Pop by soon to see the latest and my pattern “launch” for Fall. When sitting on my deck in the summer I often watch the spiders and other insects move about while knitting (of course) and having a coffee. It amazing me the bees, spiders and other insects that are needed to keep our greenery, birds and other creatures alive. I especially love watching and listening to the birds that continue to be drawn to our yard. I love Summer, it is such an inspiring and wonderful time of year. Enjoy your summer and collect your warm memories for the cooler days that follow. Enjoy! Love the colors, style and really LOVE that butterfly! So beautiful.